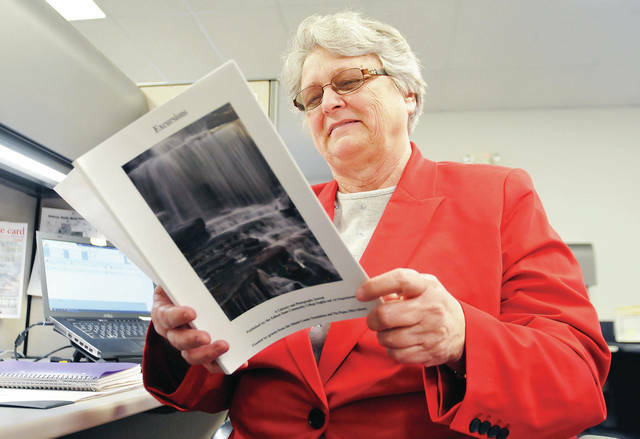 Betty Paulus, of Russia, looks through a copy of “Excursions,” an Edison State Community College publication that includes one of her essays, in the Sidney Daily News advertising office, Thursday, March 21. Sometimes when we adults think back, we realize that some of our most important childhood lessons were learned in waysthat we did not expect at the time. This is a story about a most unusual teacher. One morning, my mother called to myyounger brother and me, “Dad’s home.” Slam! Slam! The screen door banged, and we were outside. By that time, my brotherwas yelling at the top of his voice, “A pony! A pony!” And there was a pony on Dad’s old green truck. We children werejumping up and down with excitement. We couldn’t wait for that truck to stop. Dad turned the truck off, put down the rampand led out the pony. It was a drab brown color and needed a good grooming, but at the time, it was the most beautifulcreature I had ever seen. Dad led it around for a little while and told us its name was (of course) Brownie. Then he told us,“This is a very special pony, very special. She’s blind.” My brother and I just stood there. After all, what could a blind ponydo? But our dad told us to come and pet her. He also assured us that she would do anything we asked her to do. And headded he never wanted to catch us mistreating her. If we ever did… He didn’t have to finish the sentence. We didn’t want tothink about the consequences. Besides, we were already falling in love with Brownie. In the years to come, what Dad said proved true. Brownie was happy to carry us across the fields. As she ran at full gallop,we youngsters thought we were flying! We had to use voice commands such as “Down” and “Up” to cross a ditch or “Easy”when going down a slope, but she never failed us. In fact, Brownie gave us a very special gift: a tiny, beautifully spotted,perfectly healthy baby. That little filly was the beginning of a lifelong love of several ponies and horses to come. But thatlittle filly also made me very angry. She would lie very still and let Brownie run around her, whinnying frantically, trying tofind her. Dad came to the rescue. He put a bell around the baby’s neck so the mare could hear her. From that gentle trusting old mare, we learned so many lessons! We learned to accept animals and people who may be“handicapped.” We learned that they are really only handicapped if we perceive them that way. Maybe they do things a littledifferently; but if we look for it, they always have a gift to offer. They may not have an arm or a leg or their sight. They maynot be able to do certain things; but they have something to offer. Another lesson taught was respect and love for the elderly. As Brownie grew older, she liked to stand under an old appletree in the pasture, crunching apples and enjoying the warmth of a summer day. Her teeth weren’t the best anymore andjuice would run out of her mouth as she munched happily. We didn’t care. She was more beautiful then than the first timewe saw her because we knew her. We knew her trust, her gentle ways, her willingness to give us pleasure. Brownie couldstill teach us some important lessons today. Oh! That we could have the trust in God that she had in us, the confidence to run headlong across the fields of life knowingthat he will guide us. If only we could forget our limitations and focus on the strengths he has given us. May God grant usthe compassion to recognize that we are all his children, made in special ways by him. May he never allow us to be cruel tosomeone we perceive as handicapped, weak, feeble or too old. In friendship, let us reach out to one another and share ourtalents in ways that bring out the best in each of us. SIDNEY — Three writers with ties to the Sidney Daily News have essays in a book recently published by the Edison State Community College English and Art departments. Contributing columnist Christina Ryan Claypool, of Troy, and contributing writer Paula Frew, of Sidney, are two of them. The third, Betty Paulus, of Russia, is the only one among them who is not a professional writer. At the Sidney Daily News, she is a media consultant and advertising salesperson. But just because Paulus is not a paid writer doesn’t mean that she hasn’t been honing her craft for decades. She has. Even in elementary school, she was writing poems. As an adult, she wrote short stories to illustrate lessons for the children in her sabbath school classes at the Seventh Day Adventist Church in Piqua. “I would pick a familiar Biblical story, use scripture, and then relate it to everyday life. Some things were based on things that happened when I was a child. Some were fiction,” she said. She also wrote fictional pieces for adults at the church that were delivered as adult sabbath remarks during services. She presented them about once a month for 15 years. “Those were the people who kept encouraging me to write,” she said of the Piqua church’s congregation. But church-goers weren’t her only audience. “When I was a classroom teacher (she taught kindergarten for 12 years at Russia Local School), I wrote stories for my students,” she said. When the departments at Edison State hosted a reception to announce publication of “Excursions: A Literary and Photography Journal,” March 19, Paulus was one of four writers invited to read her work there. Paulus’s essay, “A Most Unusual Teacher” is about a blind pony who taught her lessons when she was a child. “We selected interesting and well polished poetry, short stories and personal essays that were under 3,000 words, works with a sense of literary unity. We were particularly interested in writers and photographers from the communities surrounding Edison State, but we did include writers and photographers from other regions of the country, too. So, the pool of submissions were sought from writers at Edison State, Miami County and beyond,” said “Excursions” editor and Edison State Associate Professor of English William Loudermilk. “Excursions” includes the works of some 70 writers and photographers, including a past poet laureate of Kentucky and Pulitzer Prize nominee, Lee Pennington; retired Edison State English faculty and much published poet Cathryn Essinger; poet Jane Kretschmann; coordinator of the Kentucky Writers Hall of Fame James B. Goode; University of Arkansas Press Miller Williams Poetry Prize finalist Roy Bentley and current Edison State English professor and writer Stephen Marlowe, who is a graduate of the prestigious Iowa Writer’s Workshop. Paulus saw a notice about the opportunity in a newsletter put out by the Piqua YWCA. “I held onto it for awhile. I got close to the deadline. The type of things I write, being morally or scripturally based, you have to find the right market,” she said. She selected two stories and a poem that she had previously written and sent them off. “I thought, ‘Why not?’” she said. She learned just a day or two before the reception that one of her essays had been accepted. Then, she was invited to read it aloud during the reception. “I was kind of proud that (Loudermilk) asked me,” Paulus said. Loudermilk and Essinger each read from their own entries and Essinger also read a poem by the late Rebecca A. Ault, a former Edison State English instructor to whom the book is dedicated. “Excursions” is available to purchase at a price of $44.83 per copy at www.bookemon.com.